Looking to lose weight by cutting down on carbs? Think again…. Truth is, you can eat carbs while trying to lose weight. Just make sure you eat the “good ones”. A lot of the trendy diets cut down on carbs completely and concentrate on high protein, which is considered to be the key to weight loss. This, however is not exactly true. You don’t have to banish carbs completely as few of the carbs aid in weight loss. For instance, the best food groups, vegetables, and fruits, have carbohydrates in them but still aid in weight loss. The key is to choose the right carbs. Satiety value of healthy carbs is high. Cupcakes, muffins, pastries, and French fries are processed and refined carbohydrates with little nutritional value. These are the kind of carbs which aid in weight gain. Replace these with healthy carbs such as 100% whole grain and fiber-rich foods such as non-starchy vegetables, fruits, oats, pearl millet (bajra), finger millet (ragi), barley, and sorghum. These are slowly absorbed in the body and also help to balance blood sugar levels. Carbs avoid higer calorie intake. Being a major food group, limiting carbs will lead to craving for unhealthy carbs, thereby altering the body's metabolism. A study conducted among women found that those who restricted carbs completely for 3 days ended up consuming 44% more calories through carbs on the fourth day. To avoid this, every meal should have 40% carbs, 30% protein, and 30% fat. Carbs help fight diseases. 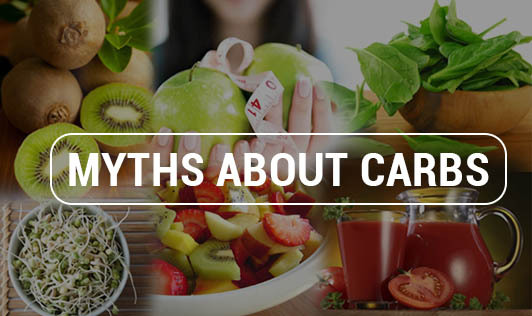 Carbs have disease-fighting agents like phytochemicals that help keep cancer, chronic inflammation, metabolic disorders, and digestive problems at bay. Research has found that people who have at least 3 servings of whole grains in a day are 30% less likely to get Type 2 diabetes.